The rising costs of healthcare are impacting more than just the patients and insurance companies. Healthcare systems have also felt the financial pinch and have begun to take more serious actions toward monetizing their real estate assets to increase their capital and decrease their debt. Healthcare has become an expensive and high-risk industry when it comes to employing and retaining quality physicians and keeping up with ever-changing technology. Combine this with declining reimbursements and increasing regulations and this scenario has called for many healthcare systems to liquidate their assets to create additional revenue. “Non-core” real estate, such as medical office buildings and outpatient facilities, have become a common asset for many healthcare systems to begin monetizing first. Locally, in Central Pennsylvania, we can look at one recent example that shows this trend. In September 2014, PinnacleHealth System sold 6 office properties to American Realty Capital Healthcare Trust II, Inc for a total of $174,100,000. The various properties ,located in Harrisburg and Mechanicsburg , totaled over 647,036 square feet. This transaction of 6 properties, which would easily classify as a mega office deal, demands attention and begs the question of exactly what benefits healthcare systems receive when monetizing their real estate assets. To help shed some light on this trend, here are four reasons why real estate monetization could help the healthcare industry the stay afloat. After using the monetization of real estate assets for core investments, healthcare systems can also use this extra capital to focus on strategic growth. Each organization will have its own unique growth strategies, but the most common fall under physician recruitment and retention, clinical expansion and growing its market share. Rather than holding on to an under-performing or non-core real estate asset, healthcare systems will benefit much more from using this capital for key strategic objectives. The recent changes in healthcare have taken a toll on hospital margins and they continue to steadily decrease. This makes the liquidity of a healthcare system ever more important, especially when analyzing its credit. The capital gained from monetization will improve liquidity – and a health system’s balance sheet as a result – allowing them to earn a better credit rating. Finally, healthcare systems will benefit from reduced legal and regulatory exposure by monetizing their non-core real estate assets. When reducing properties, they are also reducing the number of landlord-tenant relationships with which they must remain on good terms. Furthermore, a healthcare system must work hard to ensure that each of its properties adhere ever-changing regulations and codes. The more properties they own, the more opportunities for a costly violation. Additionally, the Self-Referral Law and Anti-Kickback regulations make even the perception of a conflict of interest potentially disastrous for a healthcare system, adding even more reason to simplify and condense their real estate assets. 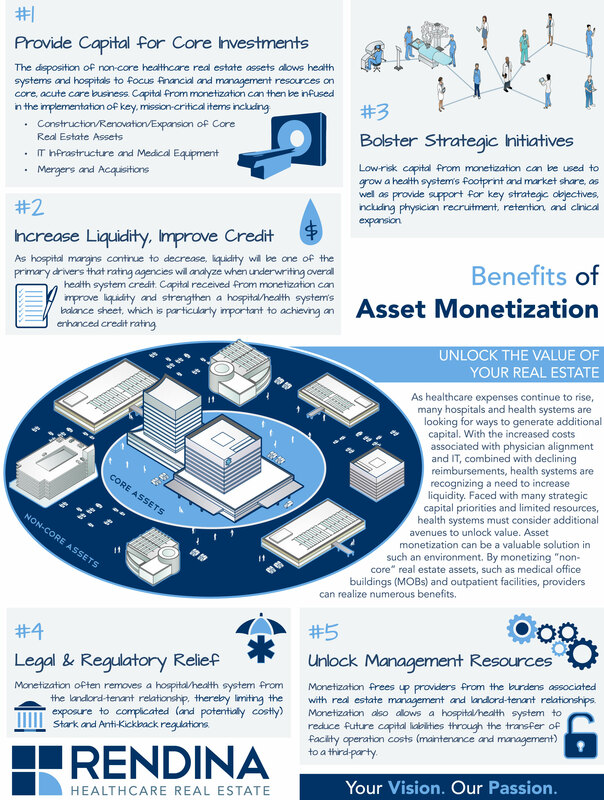 Take a look at this infographic for a visual explanation of the core benefits healthcare systems stand to receive when monetizing their real estate assets. What does this mean for the Central Pennsylvania real estate market? For central Pennsylvania, the trend toward hospital systems monetizing non-core real estate assets is a win-win. The hospital system has more capital to further its mission of providing and improving the health and quality of life for the people of central Pennsylvania. And any non-taxable real estate is put on the tax roles which benefits the community. The strong flow of institutional investment capital into the medical real estate sector will create a short- term supply/demand imbalance between the capital and available properties to invest. Simple economics suggests that prices will remain high for some period, until this imbalance changes. Thus, more owners will take advantage of the currently favorable market conditions by monetizing portfolios of properties. As PinnacleHealth’s mega office deal demonstrated in 2014, health systems have much to gain from monetizing their real estate assets. As we move into the New Year, we can expect to see this trend continue nationally and right here in Central Pennsylvania. Do you have a local or personal example of a healthcare system who has monetized their real estate assets? Share your thoughts and ideas by commenting below!